For a good time, call Joy. 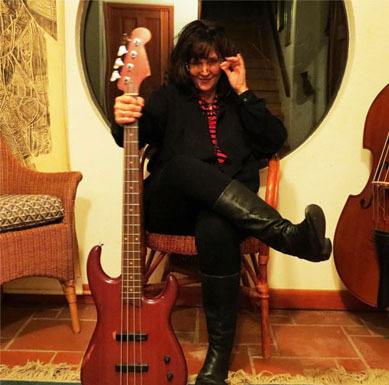 I've been a pro electric bassist and singer (lead and harmonies) since 1971. I was a folksinger before that. I'd like to join or put together a group of older pro level players, for some $ and mutual musical fulfillment. What I like most, is a stylistic mix of tunes, from blues, pop, funk, rock, country and bluegrass. There are modest local gigs around, and better $ gigs, with a little tighening up. Seeking a band, or two, duo partner, trio, experienced rhythm/ lead instrumentalists (guitars, pedal steel, mandolin). I have multiples influences and whatever styles we love to do, I want them to SIT IN THE POCKET. experience, they at least, demonstrate that I can play and sing. 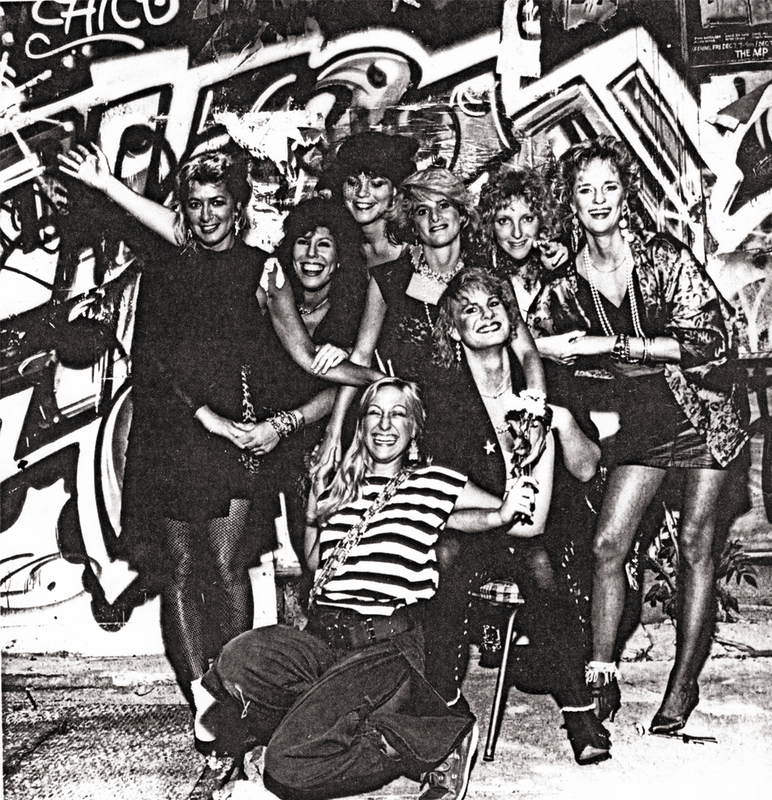 1984-2002 NYC nightclubs, casuals(aka club dates) ,cabarets, weddings, and blues bars in Manhattan, boroughs, and tri-state area. In addition to my own bands, I have played as a member, or backup band for many many many bands, including jazzy wedding bands, rock bands, orginals bands, bluegrass bands, blues bands, country bands,funk bands, calypso bands, 50s bands, 'Big Bands', Pow; cabaret bands, Irish bands, Italian wedding bands, backing up singers bands,, doo wop bands, Klezmer bands, and more. . I wish I had recordings and pictures of them all. (I'm starting a list below! 10 Jan 2013! )I moved to CA in 2003, and I've primariy worked out here as a guitarist/singer/single/ day gigs(except for a couple of band gigs backing people up)..
2011- Current; After 9 yr hiatus from bands (left nyc music scene, moved west, have been working full time on guitar & vocals, for specialty day gigs), I've been PLAYING BASS AGAIN, since being drafted for a blues festival in NC, Sept 2011. So, I've been playing out a little since then, and I have been experiencing a new-found enthusiam for THE GROOVE. .MP3 AND VIDEO LINKS BELOW...material old & new, CDs I've released, Good live recordings, video from 2011 concert in Charlotte, NC Festival in the Park, more recent footage of tunes with strangers at the Blue Monday Jam Session at The Cruising Club in Sausaltio, CA. 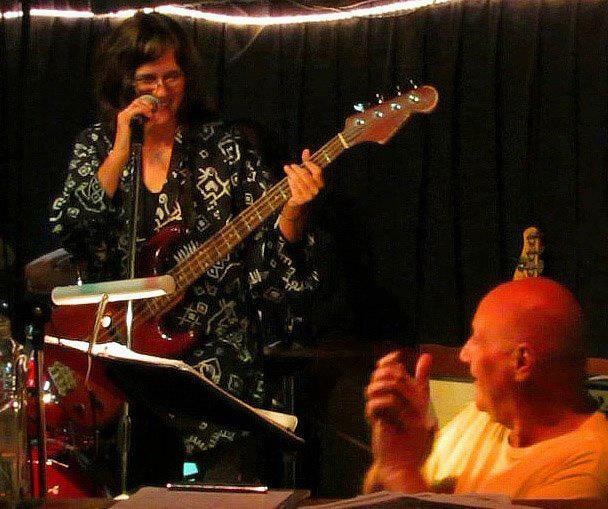 .Contact me if you'd like to meet at the Monday night jam in Sausalito, where I am meeting musicians and sitting in on a semi-regular basis. I don't always attend to let me know.1. 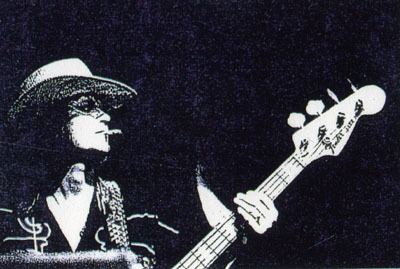 I'm always available as freelance bassist and I'm a quick study, with a killer ear. Crazy - 2011, Charlotte. I put this band together LONG DISTANCE, then we caught a few hours of rehearsal preceding the concert. Saved (Festival in the Park, Charlotte, NC Sept. 2011. Mama He Treats Your Daughter/Come in My Kitchen - jamming with jammers at Blue Monday Jam, Sausalito, CA Sept. 2013 ("Arrangements while you wait"). lead on all these, but I am a GREAT harmony singer, as well. 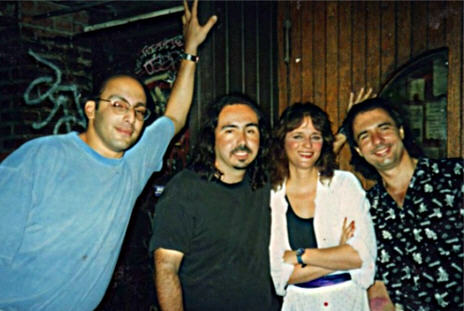 @ Dan Lynch's Legendary Blues Bar, NYC circa 1990s. Photo by Rick Gerics. A LIST OF BANDS IN WHICH I'VE PLAYED BASS. (just for fun. The ones i can remember. In NYC, I was in 4 or 5 simultaneously, at any given time) Experienced in all these different styles of music. 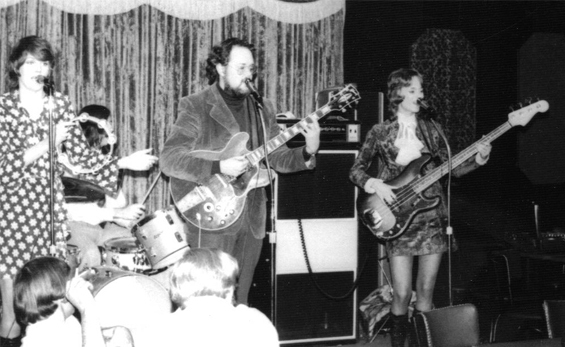 My NYC blues band, 'Chilly Whilly'. Jon Diamond, guitar & vox, Brian Mitchell, piano & vox, me, Phil Shimmel, drums and vox.